The Zohrab Center is home to an extensive collection of the academic journal “Pazmaveb,” with issues dating back to 1904. 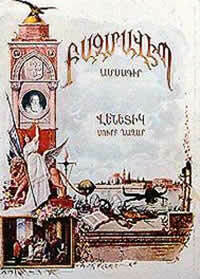 “Pazmaveb,” published by the Mekhitarist Order in Venice, Italy, is the longest-running Armenian periodical and one of the oldest publications in Europe. Founded in 1843, its first editors were Gabriel Aivazovsky (1843-1848), and Ghevond Alishan (1849-1851) both of whom belonged to the Mekhitarist Order. Published primarily in Armenian, “Pazmaveb” contains scholarly articles ranging from Armenian history to politics to literature. Not a cimment – just to ask: whwrw can I read “Pazmaveb” armenian magazine archive or/and collection online? Is there some “place” or I must pay to take a copy from e-bibloteque?